Don't hate me because I'm spoiled. But I am. I had such a nice birthday and I want to show you all my birthday booty but its actually going to take more than 1 post! Its so funny because all my friends and family know me so well and showered me with fun gifts that are all things I have been wanting or would get for myself. I'm not sure the best way to split things up but I think I'll start with gifts from friends. First of all thanks to all of you who have stopped by the blog and sent me birthday comments. I loved everyone of them. They were all very sweet to read. Thank you so much. 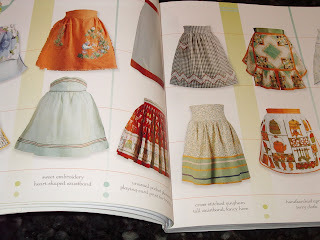 The greatest book full of fabulous aprons, patterns and pictures. 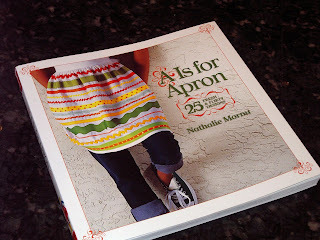 It is such a fun selection of so many different aprons. I love it. Thank you Flora. You are a dear friend. Isn't this cute? It could be a top for over a t-shirt its so darling. 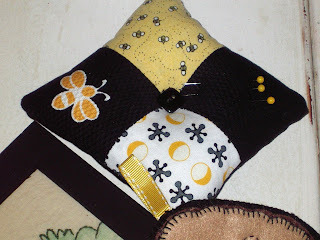 I love polka dots, rick rack and yellow. This is just so darling you could frame it. 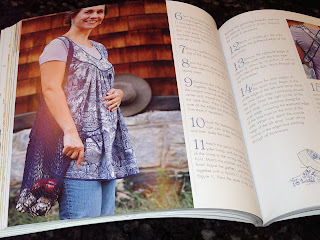 Every apron in the book is unique and fun. 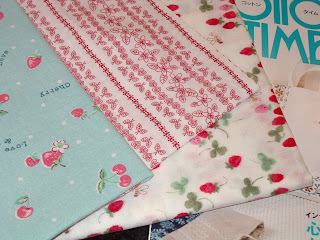 I love vintage kitchen linen. Now I need the gift of time to make them all! 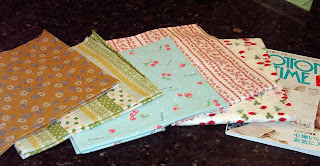 T from Purple and Paisley sent me fabric and a book from Superbuzzy. I think some of this fabric would make fabulous aprons. Its all so vintage and kitcheny, totally my taste. Cherries, strawberries, shamrocks, poseys, flowers - all so delicious. 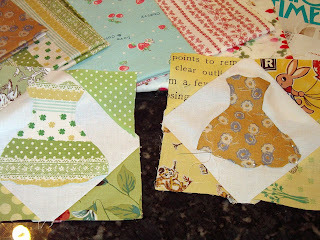 As soon as it came in the mail I cut a small piece off 2 of the fabrics and immediately appliqued them for dress blocks. So adorable. Thank you T. You know what I love. 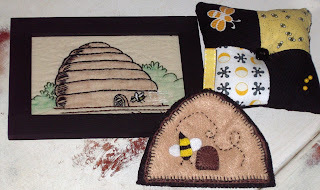 Surprise surprise, Erin from Girl with Curlz sent me "Freda's Hive" themed fun handmade gifts. Her hand work is so great and I have special places on my shelves for these wonderful presents. 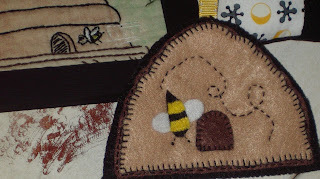 And the cutest bee pincushion. Whitney tried to steal it from me. But it stays in my sewing room! Thank you so much Erin. Everytime I look at them I'll think of you. Look what came in this gift bag from Laura! Citrus, chocolate, a bird, a scarf watch and cupcakes. What more could I want? Shelbie modeled the cute watch for me. I wore it to work today. I love scarfs. And here are the cupcakes. 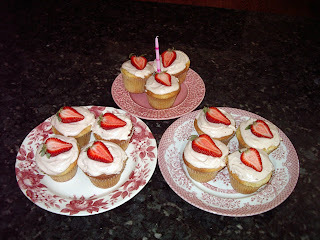 Laura knows I love strawberry shortcake and what could be better than strawberry shortcake cupcakes. They were so moist and delicious. I had to fight everyone in the house from just gobbling them up. Yummy. Thank you so much Laura, you are the best friend. And there is more from friends. Cards, a quiche, phone calls and birthday wishes at church. It was all very nice. Stay tuned and remember - I'm not gloating, I'm "sharing". You can look but not touch! Those cup cakes look good enough to share.... What lovely gifts you received. It's always a joy to be spoilt.... and birthdays are one of the best days to do it. Oh, I am so, so sorry to have missed your birthday. I was under the weather yesterday and didn't even get on the computer. But I can see that you didn't even miss me. Let me tell you that 51 isn't bad at all, you sweet young thing! 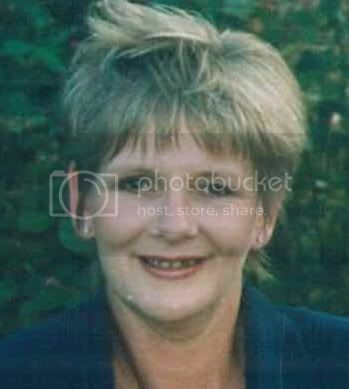 Happy Birthday Nanette. Looks like you had a wonderful day. What fabulous gifts to have received. 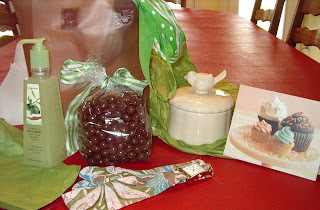 It is so much fun to receive special goodies like you did. Oooh! You got some awesome stuff! 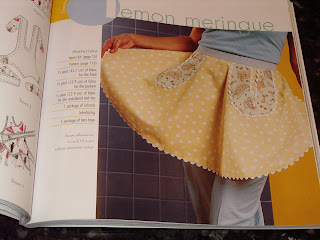 I love the apron book, and the fun fabrics you got. I'm praying for you to be blessed with the gift of time so you can do all the fun projects you want and then share them with us! Glad you had a fun day! Happy Birthday you lovely person! So nice that you got such special treatment on your day! 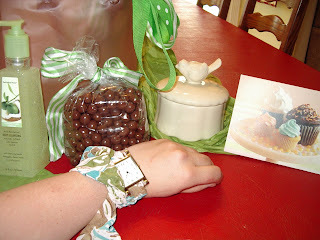 Your goodies look so wonderful! Spoiled??? No, I believe you are very loved. :-) Fabulous goodies! I love seeing your presents. You got great stuff. Happy Birthday! Thanks for sharing! I would say not bad at all!!! What a HAUL! Lucky you!! 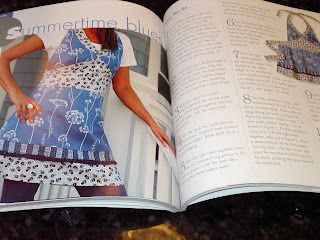 I just bought that apron book. It is so fun!! I can't wait to start sewing. Wowzers girl! What a GREAT DAY you had!! You totally deserve it. 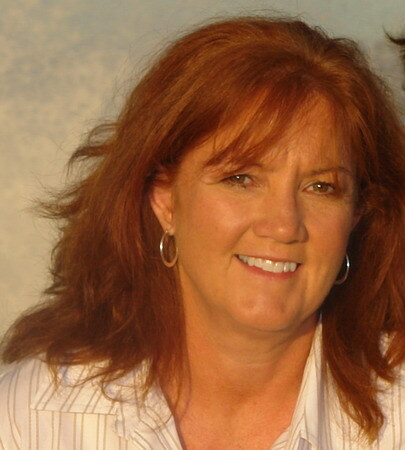 :-D Enjoy your 52nd year! !